Cerasorb M: next generation osteobiologic for dental bone grafting. A biomimetic bone graft, featuring unique interconnecting porosity that allows it to be completely resorbed while simultaneously creating new bone. Available in several granule sizes to best meet the bone resorption/remodeling needs of a variety of dental bone graft procedures. 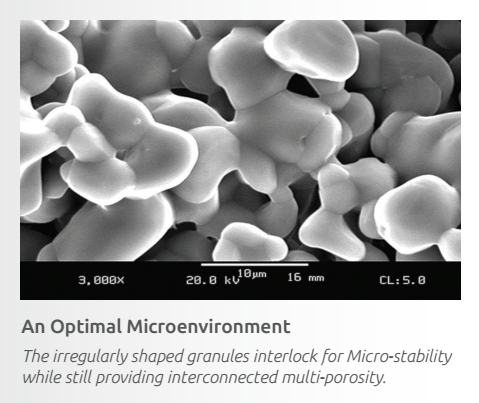 The highly engineered technology built into Cerasorb M make it as easy as M-2-3, closely mimicking human bone with a full range of Micro-Meso-Macro pores for interconnected porosity. The unique β-TCP particles interlock and provide an optimal microenvironment for cellular activity leading to bone remodeling. Szabo G, Huys, et al. International Journal of Oral and Maxillofac Implants 2005; 20:371-381. Harnack L, et al, (2009) Use of platelet-rich plasma in periodontal surgery—a prospective randomised double blind clinical trial. Clin Oral Investig. 2009 Jun: 13 (2): 179-187. Learn more about curasan and the innovative products for Dentistry.